Shaquille O'Neal had a rare combination of dominant on-court ability and an engaging and fun-loving off-court personality. 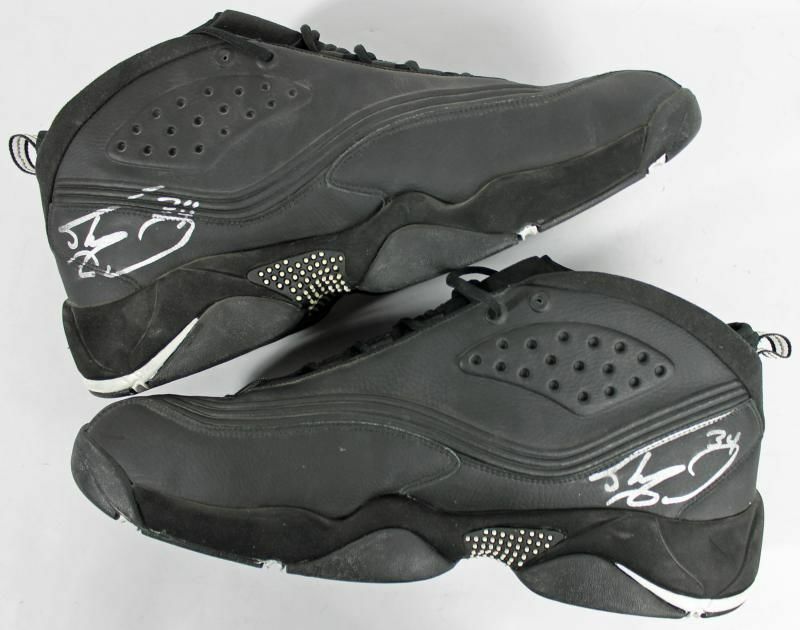 This combination endeared Shaq to fans and collectors alike. When he burst onto the NBA scene, collectors took notice immediately and the chase for Shaquille O'Neal cards pushed products to record high values. 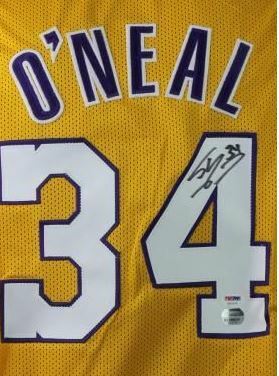 Although the values have since leveled off, there is still a special place in basketball collecting for O'Neal and his particular brand of play. 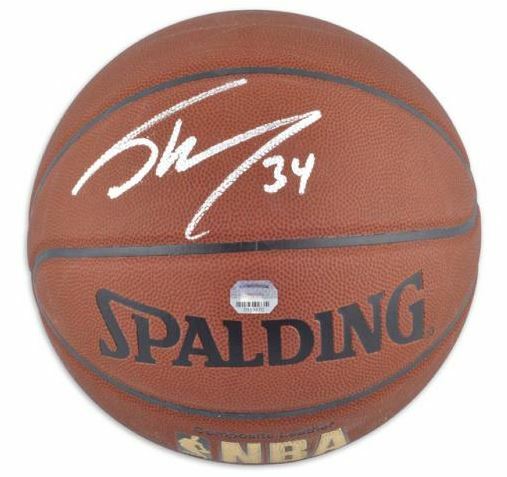 At this point, there is little short-term investment opportunities for Shaquille O'Neal memorabilia due to his retirement at the end of the 2010-11 season. Once he becomes a member of the NBA Hall of Fame, his values should see a healthy bump and his autograph should hold steady. Shaquille O'Neal cards should follow suit. 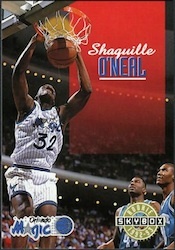 Shaquille O'Neal's NBA licensed rookie cards, of which he has seven, all hail from 1992-93 products. 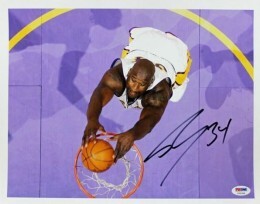 However, it was the small Classic company that was able to secure Shaq's first autographed card. The company signed O'Neal to an exclusive autograph deal in the short window that existed between the end of his NCAA eligibility and the NBA Draft. These cards can be found in 1992 Classic Draft and 1992 Classic Gold Draft As a result, they command top dollar and are treated by collectors as autographed rookie cards, but technically do not qualify to be categorized as such. A dark time, indeed, for card design. The matted colors and gold border do not do Shaq justice. However, it is interesting to see a standing image of Shaq and see how skinny he used to be. 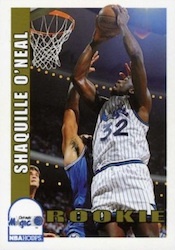 The Hoops card shows a classic two-handed Shaq dunk that would become a trademark of his career. The crisp white border flows decently and make it easy to spot wear and tear. The first of two short prints, the SkyBox card wins the award for most color based on the seemingly pointless and somewhat transparent red background that engulfs the top half of the card. Another plain card that is given a little character with an interesting image. One wonders if Shaq plans to dunk the ball or eat it. Another full-length shot with white border, this card suffers from a pixellated image that greatly cheapens the look of the card. Be on the lookout for the short printed Topps Gold parallel of this card, which is one of the most underrated (and undervalued) of all Shaquille O'Neal cards. The Ultra card definitely took a chance at being different and the gold foil gave the card a distinct look. The faux-marble design on the bottom seems out-of-place. The cream of the crop, the Upper Deck card is one that collectors seek most fiercely. It also maintains the highest value of the group. 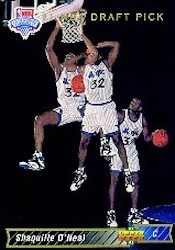 It showcased the only non-game image used on a Shaquille O'Neal rookie card, featuring him at three separate points as he progresses though a dunk. 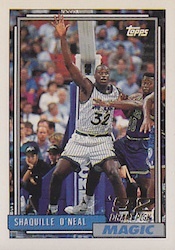 Adding to the appeal is the fact that this is one of Shaq's few short printed rookie cards. Below you will find an example of what Shaquille O'Neal's authentic signature looks like. This can be used as a first point of reference for determining the legitimacy of autograph memorabilia, but is not a substitute for having your items authenticated by a well-respected professional autograph authentication company. Reputable authentication companies include JSA, PSA, Panini Authentic and Mounted Memories to name a few. Click on any of the images below to view full size photos. A small triangle shaped character starts the signature with a long extending line on about a 45 degree angle over and past the length of the entire autograph. The second line of the triangle is much shorter and curves away from the first line towards its end; picture a printed "J" at the end of the shorter line. A figure "8" type character with the top loop flattened, follows. Finishing the signature is a fish -hook shaped line on its side. Allan � We only try to list the officially licensed NBA rookie cards for each player. Shaq is one of those players that commanded so much attention when he first emerged that collectors chased anything with his image. Many of the inserts from his rookie season, like Beam Team, were more popular and valuable than the actual rookie cards. 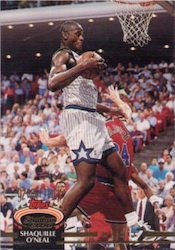 Further complicating things, upon turning pro, Shaq signed an exclusive with Classic, so his actual first cards came from them in the form of 1992 Classic Basketball and 1992 Classic Four Sport. 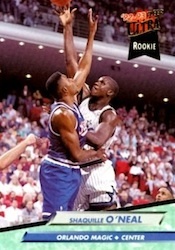 Classic took advantage of this exclusive by producing several Shaq “rookie” cards, including numbered and autographed versions. I’m not sure if you were referring to the Classic cards. In addition to the Classic stuff, there is also a Panini sticker card from his rookie year. 1992 Stadium Club Beam Team / +Members Only version, which is priced a fair bit more then the rest. I have a Shaquille O’Neal gold card. is it worth anything? 158836180. It is in perfect condition, kept in a box. can you give me some price range where you would have interest in buying ? hello I have a 1992-93 Topps #362 Shaquille O’Neal RC but its gold printed on the bottom right front corner was wondering if you could give me a possible price of signed and unsigned of this card? I have the one of the “1992 Shaquille O’Neal Classic Draft Picks Gold Certified Autographed (1 of 8500) card.” It’s #’d 0001/8500 right above his signature. I know the lower the number, the more value it has, so I was hopping you’d have an idea of what the value would be for the card? I have spent unlimited hrs looking for this card to no avail. on the front of the card is gold prism framed???????????????????????? can u help me determine its value?? 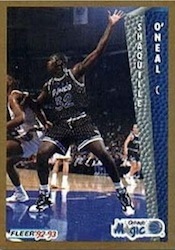 I have a standard no autograph 1992 Classic Draft Picks Shaquille O’Neil Basketball card. He is hanging from the rim in his LSU uniform #33. The stats on the back are from 89/90 through 91/92 LSU only. I was wondering if this card has any value since I guess it is not considered his RC since it is all about his college and no NBA team information on it at all. So is it a throw away or is there some value to it. To me it seems like more of an RC than any other RC card since it is actually his draft card. Thanks for your help and any information you can give me. By the way I do not care at all for Shaquille so if there is no value it would be a nice part of a fire. Hey, I inherited a bunch of Shaw cards. Don’t know.much about them. Can you give me some advice or refer me to some one that can help me sell some of them. Thank you in advance.